You may think that Irish were enjoying Irish coffee for ages, but it's not truth. In fact it was made in the era around World War II. Anyway it doesn't make National Irish Coffee Day on January 25 less appealing. 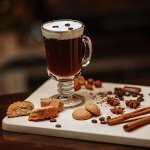 There is a nice legend about invention of Irish coffee. It says, that the original recipe belongs to Joseph Sheridan, the chef of a restaurant at Port of Foyens, the airport in County Limerick, Ireland. He was asked to make something stronger than usual coffee or tea for the arrivals, who had to come back due to bad weather. Sheridan came up with the idea of adding some alcohol to usual coffee. Whatever the story tells us, but the result came because an American asked Joe, if it was Brazilian coffee. Sheridan told him in return, that this was Irish coffee. Ten years later the owner of the Buena Vista Café in San Fransico brought the perfected recipe of Irish coffee to the USA. It took several months to achieve the same taste, as of Sheridan's coffee. When the taste was right, Irish coffee was put on the menu. The drink gained nationwide popularity and it's been a favorite one ever since.